Massage oil Banna is based on natural extracts, oils and poison of Scorpion, suitable for pain in muscles and joints of different intensity, fatigue, pinching of the nerve, bruises, sprains and ligament breaks, overstrain associated with high physical activity or, on the contrary, sedentary sedentary work. 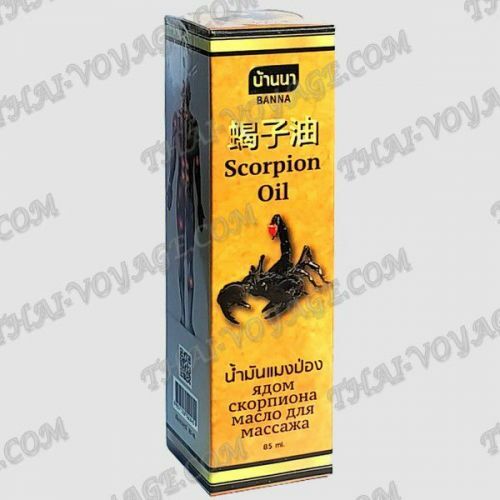 Massage oil based on the poison of Scorpion Banna is very economical and effective, when applied with rubbing movements, it is quickly absorbed without staining clothes, has a neutral aroma and pronounced stimulating, anti-inflammatory, relaxing actions. Scorpio poison, which improves the condition of a number of diseases, improves the penetration of other components to the source of the problem, accelerates the blood, eliminates discomfort, cramps, numbness in the limbs. Massage oil will be a great tool number one in your home kit, as well as a useful gift to family and friends, athletes, people suffering from problems with the musculoskeletal system. Original and unusual tool that really works! Application: apply the oil with massage movements, then wash your hands thoroughly. Do not use on damaged skin, avoid contact with mouth, eyes, mucous membranes.